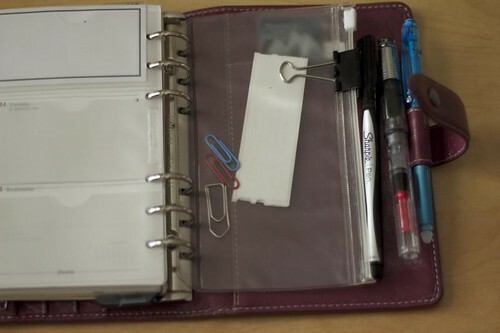 Most refill and insert options including those from other companies (Day Runner, Franklin Covey, etc). Its ability to lay flat. I love my new planner, but my main issues are with the the Filofax paper quality, the pen loop, and availability for refills and inserts. I also don’t have anyone to really share this new obsession with. Aside from that, I’m happy with this agenda. In the pockets, I keep a band-aid, sticky notes, a debit card, printer ink card, a tapestry needle, and a couple of lists. The back pocket is used to hold two bookmarks: one made by best friend and one which is a ticket stub from the Van Gogh Museum. I clip the Lamy Vista to the the notebook pocket and keep a Frixion Light Blue (the only colour blue I could find) Fine Point in the Loop. 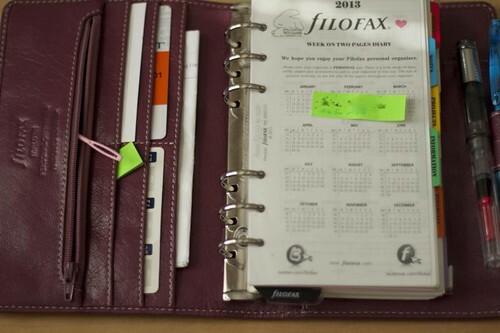 Decoration: I really like the creativity of other Filofax bloggers, but I’m not as a creative. I’ve started using some washi tape and I use some stickers on my most frequently viewed pages. I colour code things: Black for most things, Red for Important, Blue is usually a Frixion Pen for contacts and certain appointments, Green and Purple is for highlighting and misc fun. Sections: I bought the colour coded tabs pack from FF. Flyleaf: Whenever I need to buy things right away or quickly jot something important done, I use the a stickie/post it note here. Information: A rather small section on FF stuff, the international conversion sheets, and clothing sizes. Notes: Self-explanatory, but bare. This includes a quotations and words section for ones I like and remember. Noting poets I like and need to read more of. Projects: Ongoing goals and projects including a list of things I want to do, a separate page for Books, Movies/TV, Blog, Knitting, Fitness, Music and Spirituality. These are for note taking and reminder about my goals. 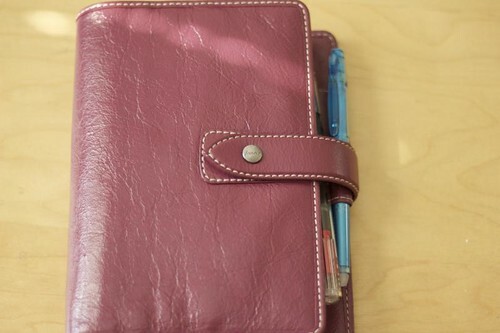 Financial: This is where I keep my shopping lists for general things, pens, cosmetics, trips, and my Wishlist. I keep the black divider on this page for things I need to purchase. I also keep information about my bank accounts. Diary: Currently using the one supplied, but I’ll probably get the Week On Two Pages with Notes for 2014 as that has been my preferred method or try a Day Runner refill. I haven’t decided yet. Addresses: For contacts, but I also use it as a file folder for misc information such as my library card number, credit card emergency numbers, wifi information, aromatherapy recipes and more. The back has extra paper and the included card holder envelope which has some of my blank cards. I keep these on me since I don’t have business cards. I also have a side opening envelope that I got from a planner a penal sent me years ago (too bad I threw out the rest of it diary). I keep an address sticker and some paperclips in here for now. The back with an extra pen. Pens & Pen Loop: I’m a pen hoarder. I have always liked writing paraphernalia. I have pens in each of my bags and it’s rare when I don’t have one. I use my Lamy Vista fountain pen which I hook to the back slot. The ink is Pelikan 4001 Brilliant Black. There is some ghosting on the other side of the page, but it is not as bad as some other inks. I also use a Pilot Frixion eraseable pen both in the 0.7mm original and a Light Blue Point for certain things: addresses, birthdays, social events, and stores for shopping lists. I sometimes us the Frixion highlighters too because they also do not bleed. While I keep all my planners in storage, I really do not care if they archival quality, but if you do, the Frixions are not a good pen. They aren’t good if you live in a hot climate. There is a clip attached to the envelope that I can use as a pen holder for a third pen. In this case, it’s the Sharpie Pen which is another great pen, but bleeds more than the fountain pen ink. I also like the Staedtler Triplus Fineliner. The pen loop is very limiting at 9mm. The Frixion Point is doing alright, but I also find the Staedtler Triplus Fineliners fit into it. Refills/Inserts: I kept most of the items that came with the Malden except the finance sheets. I use previous year’s calendar which I use for notes and lists. I bought the colour tabs, the clear ruler, and some anniversary pages for next year. I would really like the chance to make my own refill and paper. 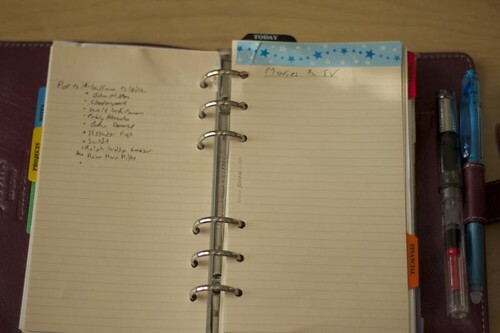 The Filofax paper quality is not the best and it would be better if I got the chance to make my own. My biggest issue is that I don’t have a diary 6-hole punch. I would need to import one for at least $30-40CAD. If I get the chance to go back to the UK or the US in the future, I’ll try to buy one then. While this is my first Filofax, this is not the first that I bought. I ordered a Pocket Finsbury before my trip and it arrived after I got the Malden. I’m looking into an A5 as well. Sam Flax (3 W 20TH ST): Largest selection with alright service. Bought a credit card holder for my Pocket Finsbury. I would revisit just because they have the best overall selection of FF products. Lee’s Art Shop (220 W 57TH ST): I do not remember much about this store only that I was not in it for long. It seemed busy, bright, and clean. Jason Office Products (140 W 31ST ST): This was actually my favourite in terms of service. It’s one of the less fancier of the stores. It was darker and not as polished, but the owner/manager had a friendly warmth about him. They had a decent FF selection too. I bought a Rhodia No. 11 pad there for the cheapest I had seen it compared to the other stores at $1.65. Recommended. I’ll definitely revisit since I feel good service is important. Columbia Omni (220 W 57TH ST): Small FF selection and a bit claustrophobic and messy store. Did not explore long as I didn’t plan on even going to this store, but stumbled on it after Jason’s. Art Brown (2 W 45TH ST): This place had literally two or three Filofaxes. I am not sure why since they are listed as a “Gold Account”. It does have a great selection of pens and inks. Service was non-existent as none of the three people working there even acknowledged me. I would considering going back for the pens though. A I. Friedman (44 W 18TH ST): By the time I had gotten here, I had given up the idea of finding a Malden. When I asked to look at another planner, I saw the Malden lurking in the back. It looked black or brown in the dim display case, but it turned out to be this pink Malden. They have a good selection, and a clean and large store. Service was decent and they gave me a student discount even without a card. I hope you’ve enjoyed my first Filofax and Stationery post. I will update my setup in the future and what works for me. I write in my planner every day so it is constantly changing and being added upon. Edited to Add – December 2013: I have received a number of messages asking me whether I will sell my Personal Malden. It is not for sale. It is my only Personal Malden and my main planner at the moment. In the unlikely event that I do sell it, I will post about it here. I suggest looking or posting at Philofaxy AdSpot. Thank you. I used to carry a planner, but I lose things so easily. Thankfully by having a digital one and only having to keep track of my phone I’m better about it now. 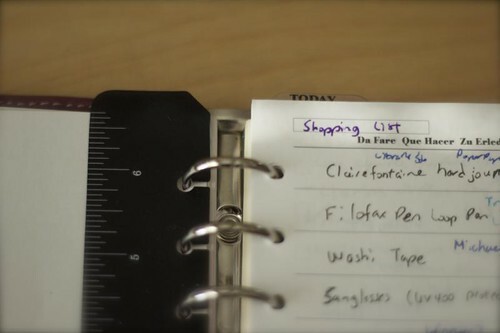 Although there is something classic/classy about having a physical old-school planner. Hi Geoff! I don’t think I will ever go completely to digital even though I do organise most of my life on Evernotes nowadays. There are definitely benefits to a physical planner though; it’s always on and it’s personal. I remember things better when I write them down. I’m just plain ol’ fashioned in a lot of ways. Thanks for commenting and have a great week! I honestly don’t know where I would be without my Filofax! I am avert visual person so lacing my week in front of me whenever I need it is important to me. It’s usually lay open on my workdesk or coffee table at home haha! Personalising it and continuously attempting new inserts (especially if you make them yourself) I find encourages you to use it more as you feel a sense of pride and satisfaction of completing something so personal and unique (and if you’re just a perfectionalist or an attempted creative person like me, you’ll feel thrilled to have made it through!). It does become addictive though, I find now that I change my inserts/create new dividers etc based on my mood/style etc… But we are women and we are allowed! Welcome Kes! I’ve read some of your blog entries via Web Finds too. Thanks for commenting. 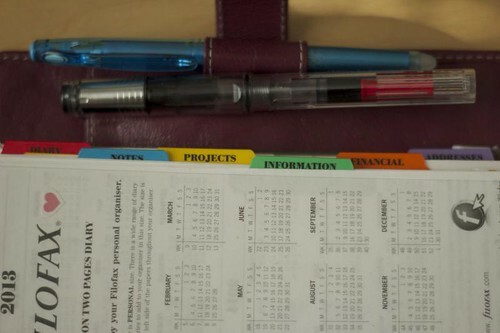 I also can’t live without my planner, but now with a Filofax, I’m overdependent on it for everything. I am not good personalizing though, but I’m doing my best. I love to write in my planner and I can’t wait until I get a new one. I’m seriously looking into an A5 these days for my at home writing. Cheers! I found my 6 holed punch on EBay. Best thing I have bought. Goes from mini size all the way up to A5. All metal and very accurate when changing to different sizes. Love the colour. Hi Andrea! Sadly, being in Canada, shipping from international is expensive. Which model is it though? Maybe one day I can find a way. Thanks for commenting! Hi there, would you be willing to sell this malden? I’ve been searching for a vintage pink malden for months! Hi Annie! Unfortunately, this is my main organiser right now so I am not willing to part with it until I get another comparable Malden. I know it is an in demand item though. Try posting on the Philoxy AdSpot? In the future, if I do sell it, I’ll look for Wanted buyers on that site. Good luck! Hi Eleanor, I am not selling it. Good luck on your search though.